Western blot analysis of extracts from various cell lines, using 4E-T Antibody. 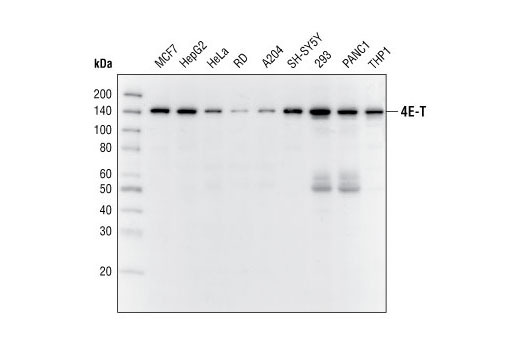 4E-T Antibody detects endogenous levels of total 4E-T protein. Polyclonal antibodies are produced by immunizing animals with a synthetic peptide corresponding to the sequence of human 4E-T. Antibodies are purified by protein A and peptide affinity chromatography. During translation, eIF4E binds to the 5' cap structure of mRNA and helps mRNA bind to the ribosome. There are several factors that associate with eIF4E. One of these factors is eIF4E-Transporter (4E-T) (1). 4E-T has an eIF4E binding site, a nuclear localization signal and two nuclear export signals (1). Studies demonstrate that 4E-T functions as a nucleocytoplasmic shuttling protein mediating the import of eIF4E into the nucleus (1). Recent findings indicate that 4E-T, along with eIF4E, is concentrated in the processing bodies (P-bodies) in the cytoplasm (2). Furthermore, 4E-T decreases mRNA stability (2). Dostie, J. et al. (2000) EMBO J 19, 3142-56. Ferraiuolo, M.A. et al. (2005) J. Cell Biol. 170, 913-924.